At Temple Beth El, we warmly welcome and embrace interfaith families and encourage them, as we do with every congregant, to participate in synagogue life — to pray, study, celebrate Jewish holidays, and share in lifecycle events. Our members are as diverse as the communities in which we live, and interfaith families are an important and growing part of that makeup. The program ensures that interfaith families are welcomed and integrated into synagogue life to the fullest extent possible, and it allows congregants to explore issues relating to interfaith marriages so that the heritage and traditions of Judaism can be respectfully and lovingly shared with family members of a different faith. For more information or questions about TBE’s Keruv program, please e-mail keruv@tbe.org. We offer interfaith family members the support and resources to create homes rich in Jewish tradition and to share the gifts of our faith, our rituals, learning and fellowship with them. In turn, we are enriched by the contributions these families make to our spiritual, cultural, educational and community initiatives. The following is a sampling of practices designed to make interfaith families feel welcome. In defining these practices, we have reached out in dialog with members of our community and other synagogues to define positions that are both inclusive and consistent with the letter and spirit of Conservative Judaism. Interfaith couples and families are eligible for membership on the same basis as all other couples and families. Every adult member has the same voting rights, regardless of their faith background, and may hold office, join committees, and fully participate in all study, social and volunteer activities. In all lifecycle events, such as welcoming newborn babies and Bar/Bat Mitzvah, all family members may stand on the bimah (podium) to join in celebration, offer congratulatory remarks, lead English readings, open the ark and stand by the Torah. All children whose families want them to have a Jewish education are welcome in our religious school and may participate in all of its activities. We also sensitize our teachers and instruct them how to respond meaningfully to questions and situations that arise from children of interfaith couples. While Temple Beth El clergy are restricted from officiating at interfaith weddings, the children of TBE congregants who marry are offered a complimentary one-year membership in celebration of the event as long as one spouse identifies as Jewish. In times of need, our clergy are available for all interfaith family members. Many Jewish traditions are universal in their ability to provide comfort and support. Because no policy or practice can account for the specific circumstances of every family, please speak with the Rabbi about your personal questions and accommodations that might be made. Grandparents love to share family traditions and holiday customs, but what happens when the grandkids are being raised in an interfaith home? 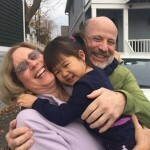 The Grandparents Circle is a TBE program designed to help grandparents of interfaith children share their Jewish identity with the next generation. The program is held once-a-week over five consecutive weeks. Class size is limited to allow for personal exchange and dialog. If you are interested in participating in a Grandparents Circle, please e-mail keruv@tbe.org. For those interfaith family members who retain their religious identity, yet desire to be active members of our synagogue, we are inspired by your commitment and grateful for the support you give to your Jewish spouse or partner. We also understand that conversion is a personal decision, and there is no requirement or pressure to convert to Judaism. If, however, you wish to explore conversion at any time, our Rabbi can answer your questions and guide you through the process. Wherever you find yourself in your personal and spiritual journey, our doors are open to you, as was the tent of our ancestors Abraham and Sarah — open on all sides to welcome travelers coming from all directions. If you would like to meet other interfaith families who are members of the congregation, simply give the Rabbi a call.